The CFO entering a new role is faced with a host of challenges, it can be a roller coaster of learning. So it can be tough to work out what to tackle first and how to work out what makes it into your plan for year one. We help you to work out what make the biggest impact on how well you perform in your new role, and where to focus your efforts to get the biggest returns, in this 90 day plan. New Finance director? What to do first. When starting a new role in any function, there is a mix of excitement and trepidation. With a new C level appointment the business expectation is that things are going to change. That can spawn a sense of fear or new hope depending on the frustrations and business culture which exist. There's some homework you could do to better understand the state of mind of the people in the business, but most start their new role with a broad understanding, hopefully backing for the CEO for change, and little else to inform them of what they are walking into. Getting the tone right when walking into your new role is paramount. Which means having conversations, asking questions and listening to people. Then you need to get to grips with the business, it's culture, structure and influencers. This will uncover the pain-points and where processes and systems need to be improved. With this information, you can build a plan. The final part of the jigsaw is executing your plan, and that needs access to data, good communication and collaboration, and a team who can add value through analysis and insight. From the board, to investors, functional managers to your team, there are a cast of new characters to get to know when entering a new role as a CFO. All are important and for different reasons need to be listened to. You need to win the trust from the leading roles to get them to back your ideas, whilst building respect from those in the business and your team to understand where frustrations have built and what is needed to fix them. Identifying key influencer's means time can be spent with the right people to get backing for your ideas, as well as support to make changes. It might mean more time managing Investor relations or auditors or key functional heads. This s a group which many overlook, and yet they can help deliver plans. Not forgetting they are also internal customers of finance. What is for sure is that your team are critical to you delivering a plan. Without their support you are going to sink. So an early assessment of the skills of your team will pay dividends as they will be critical to delivering and making your job easier. Be brave early on to ensure you have the right talent to make your ideas happen. Listening to the woes around processes, access to information, systems and communications which frustrate performance, are important in understanding where change needs to be directed. So take time meeting all the key players. When embarking on a new role learning the nuances of the business is going to be important. Investor relations, which demand more forecasts and specific reports could take a lot more of your time. Or maybe there are issues around accessing information or addressing what auditors have flagged. A strategic review which audits how value is created in the business helps build a picture of what makes the organisation tick, how the company makes money, it's margins and return on invested capital (ROIC), alongside the usual performance metrics will help CFO's. However you must also consider potential ways to improve these drivers, such as sources of growth, operational improvements, and changes in the business model, as well as how much the company might gain from all of them. To develop that understanding, several CFOs we interviewed conducted a strategy and value audit soon after assuming the position. They evaluated their companies from an investor’s perspective to understand how the capital markets would value the relative impact of revenue versus higher margins or capital efficiency and assessed whether efforts to adjust prices, cut costs, and the like would create value, and if so how much. When moving to a new sector and or business, be prepared for cultural differences, schedules and peaks and troughs. Your role may be more high profile in a growth business with private equity investors, or in a well known brand. PR and promotion may become part of your remit, which will impact on your time. There are businesses which have very strong departments which demand more attention and 'shout louder' than others. Culturally this may mean you have to give them more of your time, or it could be they are impacting the development and investment in other parties of the business. Culture is tricky to navigate in a new role, and certainly the hardest to influence. Process improvement is one of the driving forces behind many transformations. Yet with the advent of new technology and the promise of benefits in time saving, costs etc. It is important to weigh up if the benefits outweigh the investment and time needed to make it happen. Second to benefits is the realisation of benefit. Some improvements payback fast, whilst others take time to realise. A new ERP systems will benefit many but may soak up months of time and energy, whereas better reporting functionality could ensure everyone stays better informed with better data and take weeks to deploy. So remember to think about how a big project will impact you and your team. There is only so much time in the day and year to fit in projects, so make sure you don't sink your team and you too early on in your venture. We touched on this under people, but your team is what will ensure your plan gets delivered. 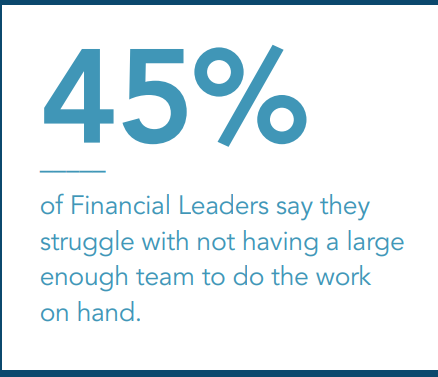 Good finance people are hard to find these days. Its important that they are doing value added work. Time spent number crunching, reconciling and defending data isn't adding value to the business. Conversely a team that isn't engaged with asking the right questions or analysing results may not be right for a forward thinking business. Old school skills might need retraining or you may need to recruit in some new blood. The better your team are at fielding issues, adopting new systems and speeding up the process of producing numbers, plans and budgets the more they will support and relieve you of time spent fielding issues. Planning is one thing, realising a plan is another. The first hurdle is to build a plan. Planning needs everybody involved, contributing and collaborating to build a complete picture of how growth, targets and performance impact every part of the business. A plan relies on good data and information, modelling scenarios to better analyse the possible outcomes to feed the financial, and strategic plan. For planning to stay current and collaborative it needs the right tools behind it, and has to be easy to produce and update. When a business is growing and changing fast, out of date plans become irrelevant, and the people stop using or referring to them. Investors aren't interested in reports which aren't a true reflection of the current position, and the board quickly feel nervous if they don't know their FD is in control of the numbers. Planning should drive better decisions, measure performance accurately and provide insight. Reports are a communication portal, so making sure you can share information easily to all will make sure everybody understands the plan and why it is important. This supports plans getting delivered successfully. Don't under estimate the importance of communicating your plan. When people get relevant, well structured information in a format they understand and like then they can contribute to the debate - without it, they tend to switch off .